Goose Foot Street Furniture were approached by RJ McLeod Contractors to manufacture a design for seating created by architects Ironside Farrar. 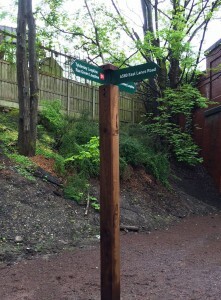 As part of the regeneration of Shore Street in Port Glasgow, we manufactured a 500mm x 400mm x 6000mm bench made from a solid piece of European Oak, with routered out/painted lettering, drainage channels and stainless steel straps. The bespoke bench also had to have a routered out recess on the underside so it could be securely placed on a granite plinth. Our first mission was to source a piece of timber big enough to be machined to the desired size. After a considerable search, we managed to locate a supplier in France that had a ‘kiln dried’ piece big enough to achieve our aims. Once the piece had arrived from France, we had all the necessary machining undertaken locally whilst we were manufacturing the 316 grade stainless steel decorative straps in-house. The routered out letters spelling ‘Port Glasgow’ were then painted in black before we proceeded to apply four coats of protective treatment. The steel straps were then fitted using 8 x M12 Coach Screws. 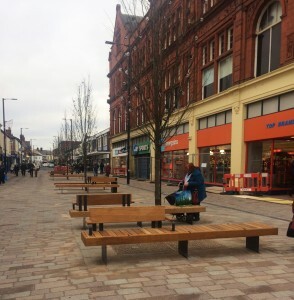 We have been involved in many regeneration and urban realm schemes over the past few years, from the manufacture of bespoke outdoor benches for a new park and ride shelter in Guildford to the manufacture of multiple seats, tree grilles and cycle stands for the £6m Altrincham public realm improvement project. 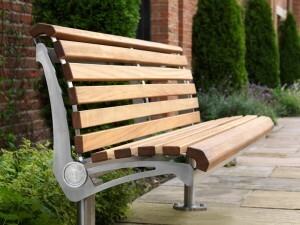 To discuss your street furniture requirements, please feel free to contact us today. MCS Construction approached Goose Foot Street Furniture with an initial design by BBM Sustainable Design Architects, to determine if we could manufacture six bespoke outdoor benches for the new Onslow Park and Ride shelter in Guildford. The new shelter consists of an indoor and outdoor waiting area, including external street furniture, which has improved the overall aesthetics of the area and provides a practical seating option for the public. We manufactured the six 1635mm x 450mm benches in-house using our laser cutting, fabrication and powder coating facilities. The benches comprise of a fully welded, mild steel frame which have been hot dip galvanised, fettled and polyester powder coated with timber slats fastened from underneath. As an alternative to Iroko hardwood, the client chose to have Sweet Chestnut wood which we managed to source successfully and to budget. 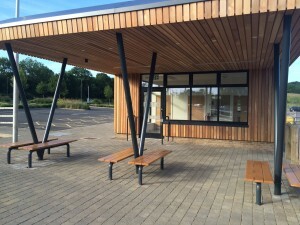 Gary Henderson, Business Development Executive at Goose Foot said: “We were delighted to be asked by MCS to manufacture the bespoke benches for the outside waiting area of the new Onslow Park & Ride building. “We are often required to work with a variety of materials, so the request to use Sweet Chestnut timber as opposed to some of the more popular hardwoods proved to be no problem at all. Visit us at London & Scotland Build! We’re pleased to announce that the Goose Foot Street Furniture team will once again be exhibiting at London Build and Scotland Build this year following the success of the shows in 2016. The exhibitions are attended by thousands of ‘movers and shakers’ from the UK construction industry, including contractors and the government as well as architects, developers and more. As one of the leading UK street furniture manufacturers, we will be on stand to discuss your upcoming regeneration and urban realm projects and how we can manufacture bespoke street furniture solutions to suit your specifications. 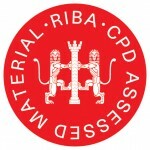 We are pleased to announce that Goose Foot is now offering construction professionals (including architects and specifiers) the opportunity to attend a RIBA approved CPD seminar, covering considerations and potential issues when specifying bespoke street furniture in regeneration projects. As part of the RIBA CPD Providers Network, we understand the importance of delivering relevant and up to date information about street furniture and the many considerations which need to be taken into account when designing/specifying products. The RIBA accredited seminar is free of charge and lasts approximately one hour, including questions and answers, at a location that suits you. Not only that, but it counts towards your required continuing professional development (CPD) hours. In addition to the seminar, we will also be offering factory tours at our parent engineering and fabrication company WEC Group Ltd in Lancashire, giving you an insight into our capacity and capabilities. The CPD seminar is delivered by our experienced representatives with over 10 years’ experience in the furniture industry. If you are interested in booking a session, please contact us on 01254 700213 or email enquiries@goosefootuk.com. We also specialise in the manufacture of bandstands, gazebos and picnic sets for parks, playgrounds and public spaces. Recognised as focal points in urban environments, these contemporary or traditional structures can be off the shelf or completely bespoke. Iroko is a highly durable hardwood that is both insect and rot resistant, making it the ideal type of wood for street furniture products. To prevent Iroko slatted seats from staining, aging or discolouring, teak oil can be used as a protective measure to repel water and shield the wood from sun and weather. Generally, it contains boiled linseed or tung oil as the main ingredient as well as mould inhibitors and chemicals that filter harmful ultraviolet rays. - Rinse the surface thoroughly and allow it to dry completely. Drying times vary depending on temperatures and outside weather conditions. - Dip a lint-free cloth, soft natural-bristle paintbrush or short-napped roller into the teak oil to saturate, and apply it to the surface following the wood grain. - Allow the teak oil to sit on the wood surface according to the manufacturer’s directions, generally 15 minutes to one hour, depending on the brand. - Rub the surface with a clean lint-free cloth to remove excess oil, following the wood grain. - Repeat as necessary to achieve the desired finish. Allow each coat to dry for four to six hours between applications. A range of our timber slatted seats, including the Emperor seat, are made using ethically sourced Iroko slats. Our range of timber slatted seats also include the Lander seat with a mild steel frame and the Magellan timber slatted seat with a satin polished stainless steel frame. If you would like to discuss your street furniture requirements, or if you would like some advice about how to care for Iroko street furniture products, please feel free to contact us today. Goose Foot Street Furniture designed and manufactured 10 curved Tula benches and 9 bespoke Tula tables for Frederick Gough School in Scunthorpe. Staff at the school wanted to provide outdoor seating areas and improve the aesthetics of the playground, in addition to creating an outdoor eating option for pupils. Going forward, the staff met with the Student Council and provided options for the pupils to decide how they wanted their areas to look. The request was made for the benches to be curved, without backs and for them to be placed around the perimeter of the playground. 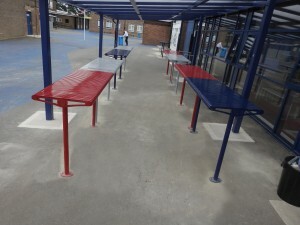 The dining tables needed to be of a height that enabled the pupils to stand and eat together. Each of the 1800m long bespoke benches were manufactured using galvanised mild steel and powder coated in-house to match the school colours; red, grey and blue. The bespoke Tula tables were then designed and manufactured following the exact same style, material and colour range of the benches but with extended legs to bring the table height up to 1150mm from the floor. The benches were scattered around different parts of the playground and the tables installed immediately adjacent to the main indoor canteen area, providing easy access and space for up to 54 pupils to use comfortably.